How does the notification process work? If you don't pay your tolls at the time of your journey or later by the deadline, we will start a notification process to obtain payment of the amount you owe. For more information about changing the owner or address on the vehicle's registration record, please see "How can I change the address to which notifications are sent?" You have 30 business days to pay or to tell us who was driving the vehicle on the date of the journeys in question. If you do not pay or send us the information we need to identify the driver of the vehicle within 30 business days, the final responsibility for paying the tolls will rest with the owner of the vehicle. You have 30 business days to submit a claim if you disagree with the notification. You can also submit a claim telling us why you disagree with the notification. Send us a message through our site or call our customer service line (707 20 25 25). What can I do if the vehicle is mine but I wasn't driving it at the time of the journeys in question? Send us the details via our website, mentioning the number of the notification in question. I wasn't able to collect my notification from the post office. What should I do? We will send you the notification again by ordinary post. We will send this notification to the person and address registered on the vehicle's registration record. How can I pay a notification if the payment deadline has already passed? Call us on 707 20 25 25. If the case hasn't yet been sent to the Customs and Tax Authority (Autoridade Tributária e Aduaneira – AT), we can help you. I have received a notification about a journey on a date when I was no longer the owner of the vehicle. What should I do? If, on the date of the journeys, you were no longer the owner of the vehicle, you have 30 business days to make your case to us. You can contact us 24 hours a day via our website. You should send us the deed of sale so that we can identify the current owner. Why have I received a notification from my bank and another from Ascendi showing different values? This is an "ICI" notification, which stands for "Identificação do Condutor Infrator" (Identification of Offending Driver). We contacted the company that owns the vehicle and this is how we know that you were driving it. So we have sent you a notification that includes an extra charge of €4.42 for each journey (2,21€ for costs associated with sending the notification to the company that owns the vehicle + 2,21€ for costs related to the new mailing of the notification to you). How can I change the address to which you should send notifications? You need to update the vehicle's registration details. The Documento Único Automóvel ("Vehicle Registration and Ownership Title " – DUA) combines the information contained in the vehicle's registration record and the ownership record in one single document, called the Certificado de Matrícula, or registration certificate. Customer service desks at the Lojas do Cidadão (“Citizens' Shops”) that offer this service. I have a tag but I received a notification from Ascendi. What should I do? There are several reasons why this could happen. To find out what happened in your particular case, you can contact us 24 hours a day through our website site.We need to know the date on which the device was activated and you should also send us a copy of your Via Verde statement for the period relating to the journeys for which you received notification. I've received a notification from the Tax Office. What should I do? We can't answer this because it means your case is being handled by the Customs and Tax Authority (Autoridade Tributária e Aduaneira – AT). You can ask them about it directly at the Tax Office where you are domiciled for tax purposes. Why have I received a notification from the Tax Office? (a) Tax enforcement proceedings: for the payment of the tolls and additional charges mentioned in the notification (€2.21 for each journey). Administration costs and interest on arrears will also be added to this amount. The tax enforcement proceedings includes the debts related with the infractions occurred each month by the same person/vehicle/(sub)concession. (b) Offence proceedings: for the payment of the fines applicable to this part of the payment process and respective costs. A case will be opened per day/person/vehicle/(sub)concession of the unpaid notification. At this stage, the minimum fine is 7.5 times the sum of the journeys made by one person, in the same vehicle, on a (sub)concession throughout one day (a minimum value of €25 applies), but it could be as much as four times the minimum value. For example, if the sum of the journeys done is €10, then the minimum fine would be €75 (€10 x 7.5) and the maximum would be €300 (€75 x 4). In the case of corporations, the minimum fine is 20 times the value per journey. The procedural costs are calculated on the basis of the Regulamento de Custas Processuais regulations governing procedural costs and they apply both to the enforcement procedure (a) and to the offence procedure (b), but if you pay voluntarily within 30 business days, you will get a discount of 50% on the procedural costs of the offence procedure (b). If you still don't pay the amount the Tax Office says you have to pay, they will start the enforcement procedure to force you to pay by seizing your assets. If this happens, the amount owed will continue to rise as interest and procedural costs are added to it. 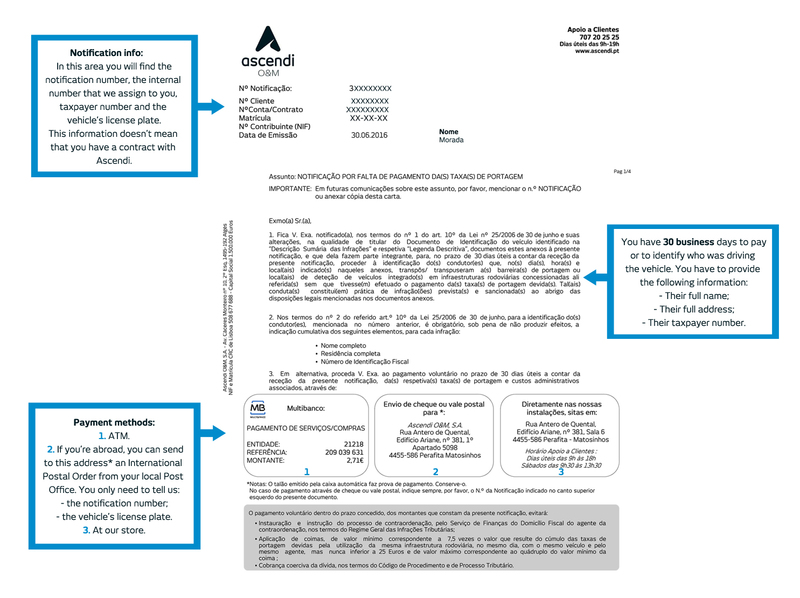 Why did I receive the letters sent by the Tax Office but not the ones sent by Ascendi? The Tax Office sends its notifications to the address you use for tax purposes. 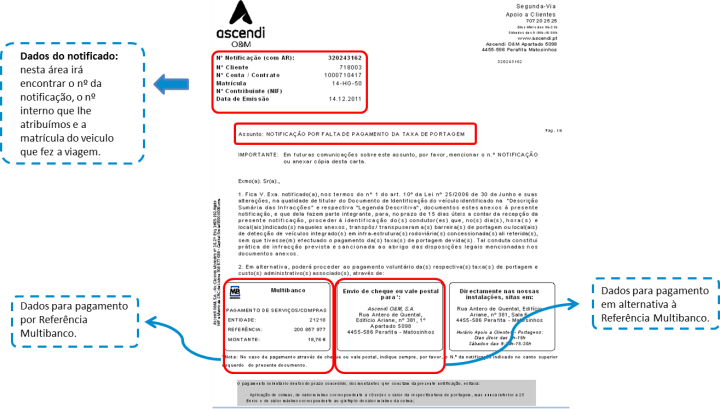 Ascendi sends notifications to the name and address shown on the vehicle's registration record, i.e. those held on file at the Motor Vehicle Registry Office. This is why it is so important that your vehicle's records are always kept up-to-date. How do I pay electronic tolls? If you travel on motorway which only has electronic toll collection and you don't have a tag, you will have to pay at a CTT post office or at a PayShop agent. If you do not pay by the deadline, we will send you a payment notification, which will show you how much you owe for the tolls plus the additional costs (€2.21 for each journey). If you still do not pay after receiving the payment notification, responsibility for collecting the full amount owed will lie with the Customs and Tax Authority (Autoridade Tributária e Aduaneira – AT). There may be a penalty and you could be taken to court. How can I find out how much I owe? As long as the deadline for paying your tolls at a CTT post office or Payshop has not passed, you can find out how much you owe at those premises. (Click here to see when to pay. ),You need to take the Documento Único Automóvel (single vehicle document) or the ownership document (Livrete) with you. For journeys done more than seven business days ago, you will need to contact our Customer Service Line on 707 20 25 25. Or you can find out online at www.ctt.pt, here. How do I pay my tolls at a CTT post office or PayShop? When you pay your tolls at the post office or at a PayShop agent, you pay an extra €0.32 for each journey (up to a maximum of €2,56 per payment). The best way to pay is with an electronic tag. With an electronic tag, you pay only the tolls; you avoid all additional charges as well as the inconvenience of having to go to a CTT post office or PayShop to pay. You can buy your electronic tag at our facilities in Matosinhos (click here to see location). How can I pay without incurring extra charges? Use the Via Verde option. With Via Verde, you only pay the toll charges, which is not the case if you choose to pay later. When you pay your tolls at the CTT post office, at a PayShop or after receiving a notification, additional charges will already have been added to the cost of the tolls. Click here to find out what payment methods you can use. I don't have a tag / Via Verde. How do I pay? You have to pay at a CTT post office or at a PayShop agent. You pay an additional charge of €0.32 per journey (up to a maximum of €2.56 per payment). If you don't pay at a post office or PayShop agent, we will send you a payment notification which includes an additional charge of €2.21 per journey. We will send this notification to the person and address shown on the vehicle's registration record. If you still do not pay after receiving the payment notification, the process will be submitted to the Customs and Tax Authority (Autoridade Tributária e Aduaneira – AT) and you will be fined. Click here to find out about the payment methods you can use. Are there extra charges if I pay at a CTT post office / PayShop? Yes. In addition to the toll, you pay an extra €0.32 per journey (up to a maximum of €2,56 per payment). These additional charges are applied according to the Portuguese Law (Portaria no. 314-B/2010). What happens if I let the deadline for paying at a CTT post office / PayShop pass? We will send you a payment notification which includes an additional charge of €2.21 per journey. We send the notification to the name and address shown on the vehicle's registration record, i.e. those held on file at the Motor Vehicle Registry Office. If you still do not pay after receiving the payment notification, the process will be submitted to the Customs and Tax Authority (Autoridade Tributária e Aduaneira – AT) and you will be fined. What should I do if I get to the post office and my journeys aren't available for payment? You can ask the post office clerk for a statement confirming your presence there. Send us the statement through our website site, explaining the situation. How can I get a breakdown of my journeys? When you pay your tolls at the post office, you can ask for your receipt to include detailed information about the journeys done with your vehicle. All you need to take with you are the vehicle's identification documents, to prove that it is yours. What happens if I don't have the ticket when I get to the toll plaza? By law, we must charge you double the cost of the longest journey you could have done before leaving the motorway at that exit. It is the ticket that you collect when you join the motorway that lets us know where you joined and how much we should charge you. Without the ticket, we have no way of knowing what route you took. If you find the ticket later, contact us through our website , attaching the original ticket and explaining the situation. There were road works on the motorway so I want to ask for a refund of the tolls I paid. What should I do? We have a specific form for this request, which you should fill in and send to us along with your toll receipt or Via Verde statement. Click here to download it. . When you have filled in the form, send it to us through our website. (You can ask for a refund of the tolls you paid for parts of our motorways where there were road works if Ascendi is contravening the terms of Regulatory Decree 12/2008 of 9 June. If you wish to claim a refund, you must do so no later than 60 days after the date which you travelled on the section of road in question. Requests for refunds will only be considered valid if they relate to Ascendi motorways and the appropriate form has been filled in and submitted along with proof that you were travelling on the road and on the date in question (toll receipt or Via Verde statement). How can I get an electronic tag? If you want to opt in to the Via Verde automatic payment service, you have two options: buy a tag or hire one. If you decide to buy a tag, it will cost €27.50, or €25 if you choose the electronic statement option. When you buy a tag, it becomes your property and is covered by a two-year guarantee. When you hire a tag, you pay an annual fee of €8, or €7 if you choose the electronic statement option. If you ask to have your earlier generation tag (LDR – low data rate) replaced by one of the new generation tags (MDR – medium data rate), you will receive a promotional discount of €1 against the cost of the first year's hire, or €2 if you choose the electronic statement option. Where can I get an electronic tag? *The Ascendi shop does not follow through on requests made in advance through the Via Verde website. We also do not provide technical assistance in the event of problems occurring with tags. Can I buy just one tag and use it for all of my vehicles? No. According to the Via Verde terms and conditions of use, each tag may only be used for one specified vehicle. You can only change the tag to another vehicle with Via Verde's consent. Any problems that may arise because of disobeying the rules of use are the responsibility of the tag owner. Is there any kind of discount or exemption for goods vehicles? Yes. Click here to see how to get them. There are several reasons why this could have happened. To find out what happened in your particular case, you can contact us 24 hours a day through our website . We need to know the date on which the device was activated and you should also send us a copy of your Via Verde statement for the period relating to the journeys for which you received notification. When you have filled in the form, send it to us through our website . You can ask for a refund o2 tolls you paid for parts of our motorways where there were road works if Ascendi is contravening the terms of Regulatory Decree 12/2008 of 9 June. 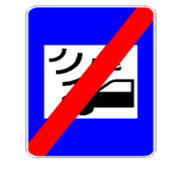 I was driving a rented car when I went through an electronic toll. How do I pay? First, you need to find out from the car hire company if the vehicle had an active Via Verde tag. When you travel through the motorway, the vehicle is automatically identified and the payment is made through your bank account (Via Verde automatic payment) or deducted from the credit on your pre-paid electronic tag (Via Verde pre-payment). If you did not let the deadline for paying tolls at a CTT post office or a Payshop pass (click here to see when you have to pay), you can pay the tolls at those premises. To do so, you will need to provide the registration number of the vehicle and the date of your journey. If your journey was more than seven business days ago, you will need to wait for the notification, which will be sent to the address you gave the car hire company. Do vehicles with foreign license plates have to pay too? I have received a notification from Nivi Credit. What should I do? Nivi Credit is the company responsible for collecting the debts owed by the owners of foreign-registered vehicles who did not pay their tolls when travelling on the motorways. When sending correspondence, Nivi Credit uses the details obtained from the competent authorities in the respective countries of the vehicles’ origin. See a detailed breakdown of what you owe. How can I tell which motorways have electronic tolls? How do I pay an electronic toll? The best way is with an electronic tag, since you pay only the tolls; you avoid all additional charges as well as the inconvenience of having to go to a CTT post office or PayShop to pay. Click here to find out about other payment methods you can use . After the 1st minute, calls are charged per second. At Ascendi we are always available to answer your questions.